Autumn is finally here and I’m super excited! I’ve always loved the season – not just because it is the time of year when leaves change color, you can wear scarves and flannel, and enjoy pumpkin everything. For me, it has always been about the food. A trip to my local farmers market found the bountiful ingredients available: end of summer treats like peaches, berries and tomatoes; the autumn fruits: apples, pears, and we can’t forget the delicious and nutritious kale, broccoli, and squashes that begin to appear. And you can’t forget the other craft fairs, political groups and alternative organizations that gather around now that the weather has cooled off. Philadelphia has some innovative food programs. 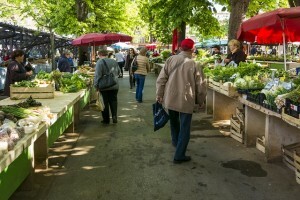 Thanks in part to nonprofits such as The Food Trust and the Coalition Against Hunger, those who are on food stamps can purchase items at the farmers market. This past week, I was in line next to a woman who had never been to the farmers market before. She asked me where to find bags to put her vegetables in while she shopped. The woman, who appeared in her late forties, also didn’t realize that each stand was a separate vendor. The workers were getting frustrated, but I gave her a few tips. After all, this was the very first time she went to the farmers market and she was going to use her food stamps to purchase kale. Neither of us could contain our excitement for the beautiful heads of kale! After reading a chapter on welfare in Deborah Stone’s Policy Paradox for class, I realized just how important of a moment I had shared with this woman at the market. Like many, I had often conceptualized welfare as providing the basic requirements for survival: shelter, clothing and food. For Stone, there is more to welfare than just the basics. In order to move beyond the basics, it is important to understand that financial status is dynamic. The market has become quite volatile. Those who are at present secure, may not have the cushion to withstand a financial downturn. In her book, Stone notes, “Half of all American children will spend at least a year in poverty before they turn 18.” This is precisely why countries have social insurance programs to help boost security among their citizens. But when we have come to measure welfare, it has largely been a question of quantity and there’s a simple reason for that: it’s measurable. No doubt, being accountable to tax payers and demonstrating evidence that policies are working (or not working) is a valuable tool in both promoting policies and accountability. However, without acknowledging quality, the data can be misleading and actually work against the interest of those whom the policy is supposed to help. For example, we may measure the success of a food program by the number of meals it serves to people in need – a quantitative assessment of the policy. What we may overlook is the quality of the meal – is it a proper meal? Does it contain nutritious foods or high-calorie foods? Do people like the meal or do they throw most of it away? While assessing both quantity and quality is important, there are also other benefits to welfare. For example, there is an intrinsic value to food. It is good because we would die without it. But it provides much more. Consider the woman at the farmers market. She was not only going to get a beautiful head of nutritious kale, she will also engage in a cultural experience she had never previously engaged in. Furthermore, since her food stamps were accepted at the farmers market, she also likely was able to fulfill other goals or needs. For example, it is possible she spoke with the group of individuals registering voters or perhaps she met with the group providing information about discounts to the Philadelphia Museum of Art. In these ways, the value of food stamps far exceeded just providing her nutrition. While it’s possible voter registration drives and social experiences occur at grocery stores, without the food stamps, she would be less likely to have accessed any of these experiences. It is this is the type of holistic thinking that is needed to promote the next wave of innovative policies. When welfare is viewed solely through a quantitative lens, we miss the other beneficial ways it impacts the lives of those on welfare. We rob ourselves of the chance to see just how complex human interactions are. Moreover, we lose the ability to see how these programs can provide more than temporary financial security by providing opportunities and experiences that can enrich and improve the human condition. Author: Laura Caccioppoli is a millennial and doctoral student in health policy at University of the Sciences. She has an MA in political science and a graduate certificate in nonprofit management from Villanova University. Laura serves on the board of The Consortium in Philadelphia and Americans for Democratic Action, Southeastern Pennsylvania Chapter. Her research interests are in health and food policy, cultural competency and social justice.